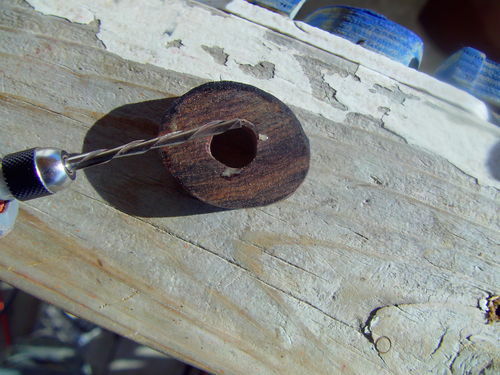 Making a Lamination Style Wearable Wooden Ring! 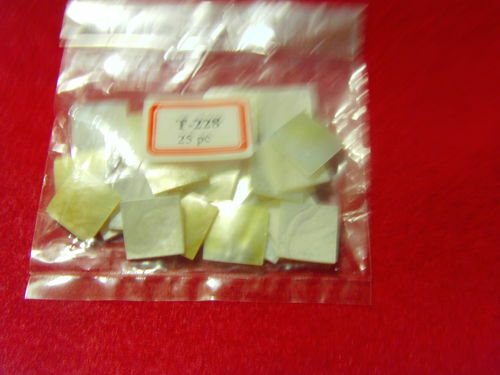 With Inlay! Hi Everyone, this is my first time trying to do a blog. So please bear with me, I’ll do my best! 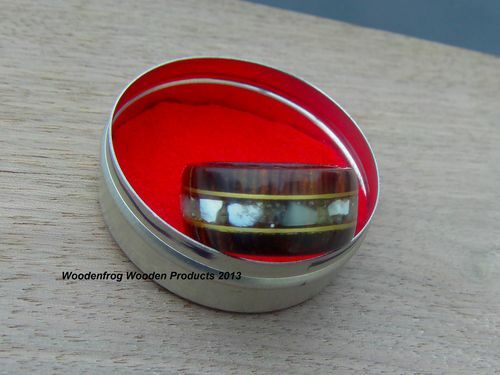 I have had a lot of request to do a blog about my rings, I do 2 kinds of rings. 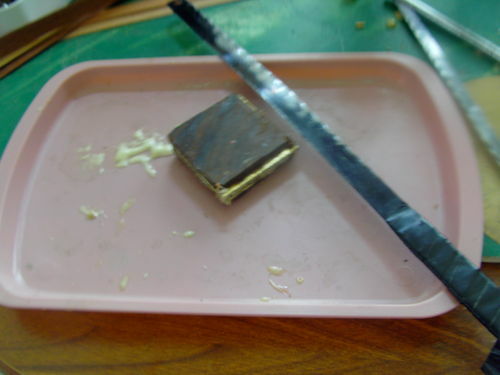 The Lamination style and the Bentwood style, this blog is on the Lamination style. 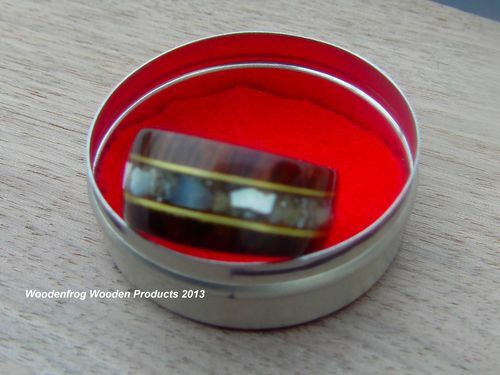 This ring is made out of Cocobolo, Brass and has a Mother- of-Pearl inlay. 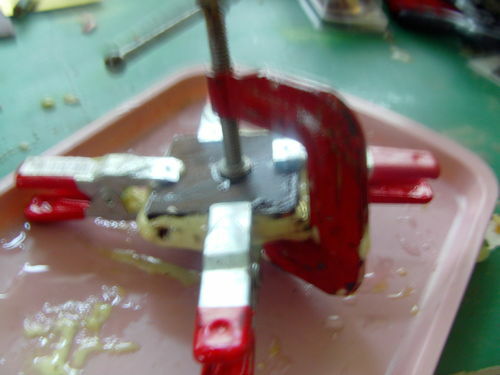 I then clean all the foamed out glue from the piece so I can see what I am working with, I use small saws to cut the piece down to a somewhat Stop sign shape, I do not have or use very many power tools. I have a blood disorder that I must take large amounts of blood thinners, Me and big power saws do not play well together. 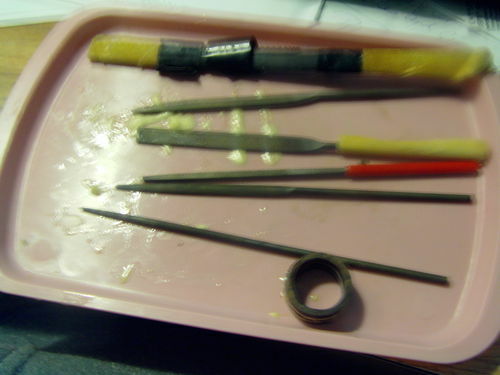 My favorite saw is an old hacksaw blade with tape around it for a handle, I do have a scroll saw but I rarely use it! I like the way I am kinda hands on for these rings( I really enjoy it!) My other favorite tool his my Dremel tools, I now have 4 different ones, it makes it easier than switching tips all the time. I also do not have a shop of any kind, I do almost everything on the front porch of the house, that is a lot of fun on real cold days. I have a little work bench in my bedroom and my kitchen table is always a second work space, Thank God I am not married!! 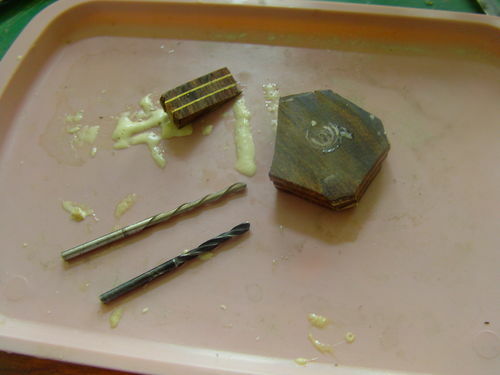 Enough about that, after I have got the ring into a somewhat stop sign shape, I can begin making it take shape, I start by inserting a drill bit in the Dremel and drilling a starter hole in the piece, so I can then use a Dremel spiral cut blade to open up the piece enough to get my Dremel high speed cutter in the hole to begin getting the ring sized! In these pics I have already started with the High speed cutter to make the ring go from Stop sign shape to a bit more round! 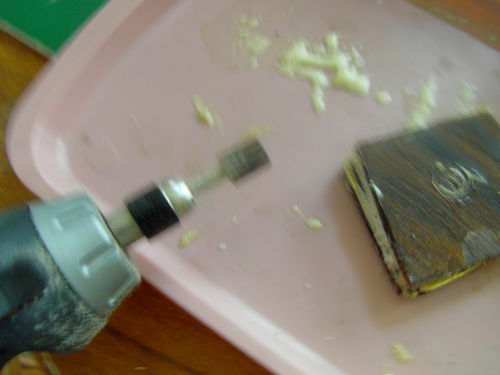 Here’s a pic of the high speed cutter that I am referring to, ! 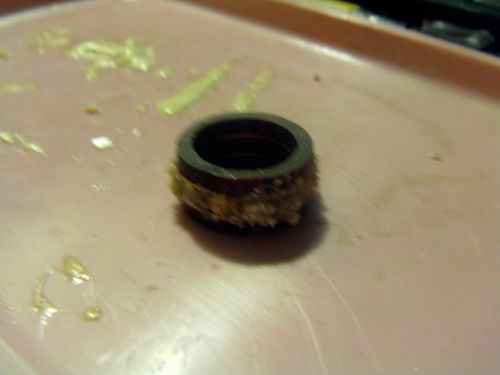 Sorry that pic is not the best, I then basically just keep at it until I have something close to a ring, I try to size the ring to a paper sizer that I printed off the net, I have a ring mandrel on order it has not got here yet! 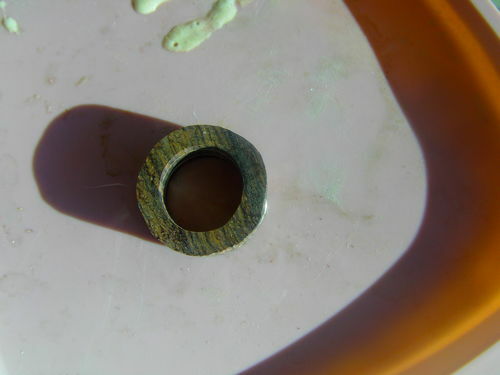 as for the shape of the ring I kinda just let the Wood/Ring speak to me. 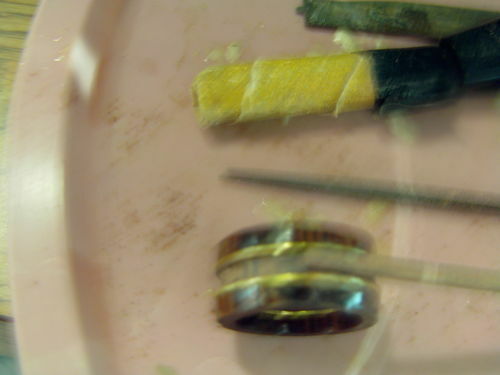 This ring will not only have the brass in it it will have the Mother- ofPearl inlay also, after I get the ring down to almost what I want. 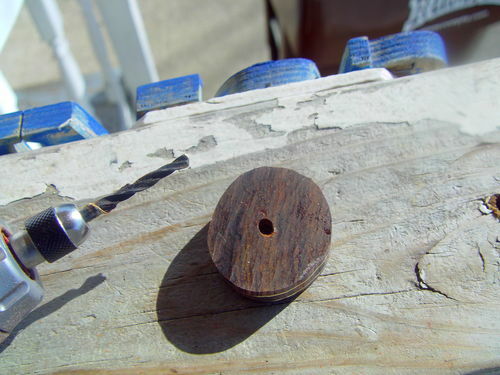 I use sanding drums of different grits to kinda almost give it that finished shape. !https://s3.amazonaws.com/vs-lumberjocks.com/mi9rb8c.jpg! 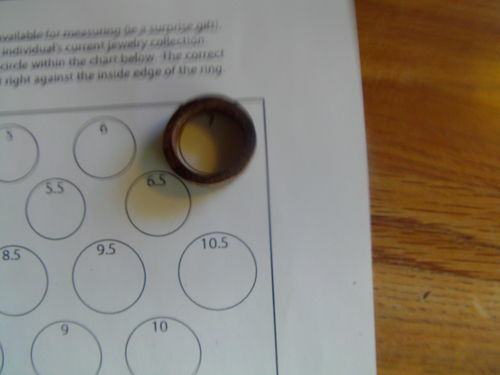 This ring is about a size seven, I make them a little larger so that when I add the CA glue finish on them, the will be very close on size, The next step is to cut a groove around the ring to have a place to put the crushed stone/shell! I use a lot of small files and things to do this, take your time this is when it starts getting fun! 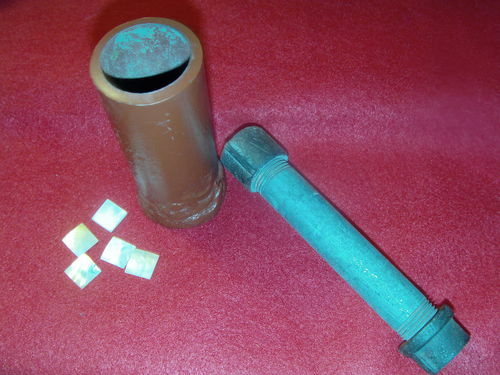 you can now prepare the inlay material, in this case Mother-of Pearl I bought off Ebay I use this little pipe on pipe thing I made to crush the small squares into crushed pieces for the inlay, !https://s3.amazonaws.com/vs-lumberjocks.com/mi9s3rr.jpg! 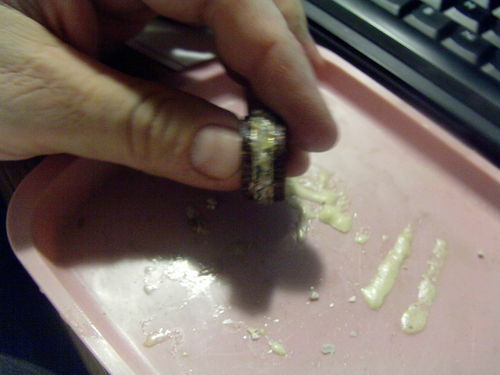 I then proceed to dab a little super glue in the groove and place a piece of shell in the groove a do this all the way around the groove in the ring. 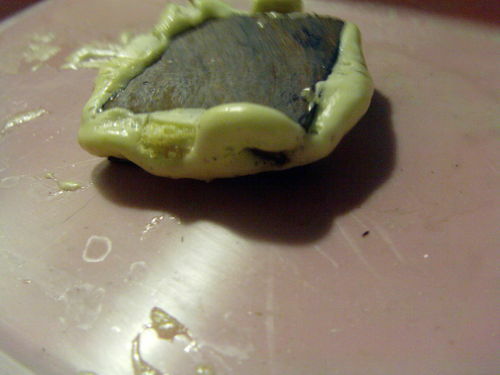 After that has dried I go back and fill the small gaps with glue and even finer shell powder. After I have all the shell in and around the Ring, I use my Dremel tool with coarse grit sanding drum to grind the shell back down to the surface of the ring and to clean off the extra glue and shell, I would like to say use caution when doing this step, safety glasses and dust mask are a a must for this, some shell and stone as well as wood can be toxic. Super glue is not fun to breath either! 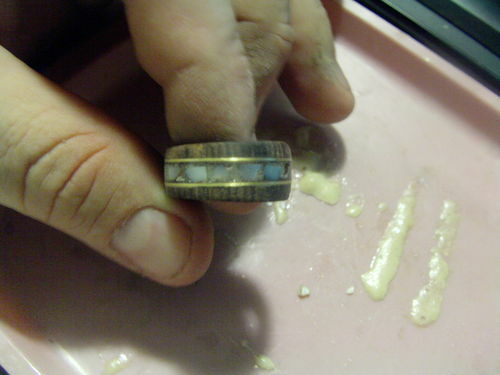 After I am satisfied with the results of the inlay, I begin to do the final sanding and shaping of the ring, this is just a mater of taste. 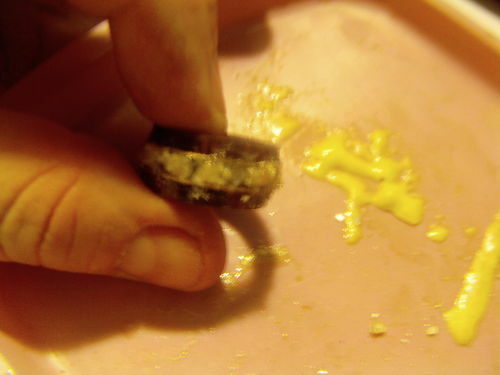 I like my rings real smooth so I go an extra mile final sanding, I then wash the ring with water and let it dry. After it is dry I sand again, wet again, sand again, this raises the grain to assure a real smooth finish! 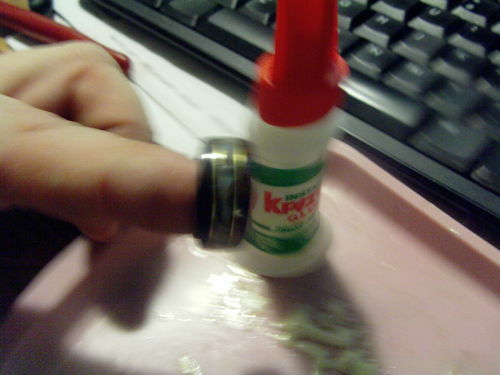 I coat the ring over and over again, most of the time with about 8-10 coats of the glue. I then use a micro mesh polishing kit to get that super gloss shine and look, if I see any spots that need more attention I add more glue and sand/ buff again. 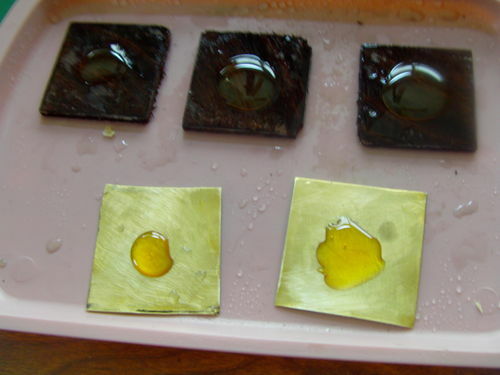 I make my on buffing wax mostly just Beeswax and Carnuba wax, melted together. I add 2-3 coats of the wax and buff by hand. 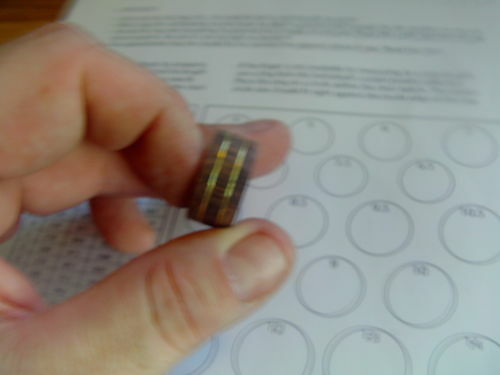 This is how I make my little rings(Lamination Style), I hope you all enjoy my first blog! I know it was long but I wanted to include as much as I could, I hope to be able to show you all how I do the Bentwood Method Soon! That is a whole ‘nother ball game! 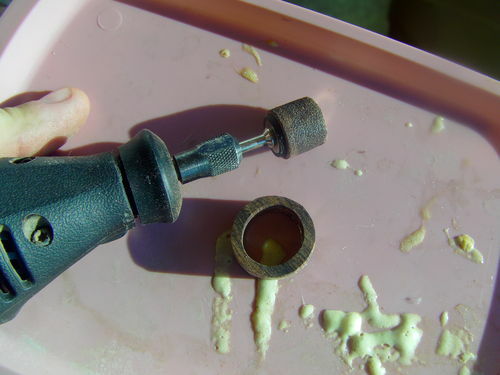 I know that some of you will say man I could do that a lot easier on the lathe, or with this tool or that tool! That is fine, this is just how I do it! I hope you all try them soon they are fun and rewarding, they take time but so does great Wine doesn’t it? Please feel free to comment and suggest(I like Reading that stuff). or if you have questions, drop me Aline Thank you all for all your help, and God Bless. Well done Robert. Congrats on your first blog. Folks shouldn’t have too many questions after your thorogh explanations, but they might. Nice ring too. Very impressive! Enjoyed reading about this. Thank you for sharing! Beautiful ring Robert, and I totally understand where you are coming from when you say that you prefer the handwork approach over the machine tools and I’d guess many others would too. Thank you Rance!! for all your help! Chris, I am glad you enjoyed this. Mike(stefang) I’m glad you liked the ring, with my health it is real hard and scaring to get near all those Big, Scary Saws!! But I love working with Wood!! Thanks! Robert, It’s a beautiful ring and a great blog. I don’t know that I will begin making rings, but your process has me thinking on ideas for my boxes. Thanks for putting all of this together for us. Thank you Joey, I’m glad I could be of some help! Good Blog Robert, and that Ring is Precious!! Great project….Thank you so much for sharing…. I have wondered how you did such fine detailed work on your rings. 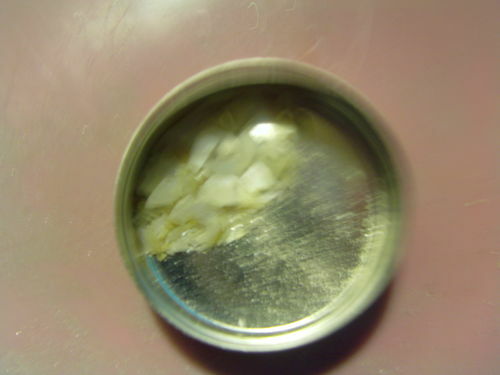 The Blog was great as well…. Please do one on your bentwood style the next time around…. Thank you, Mike glad you liked it! Rick, I’m glad you liked it! It will be a little while but I’ll try to get one done! The Bentwoods are a lot more work! 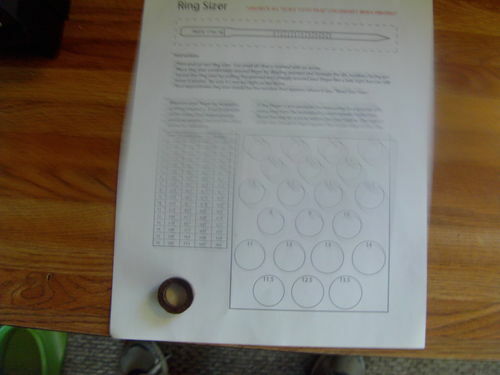 Thanks Robert for taking the time to post this Blog it will come in handy when I want to make my 1st ring. I really enjoyed this blog Robert!! It was really enjoyable and I learned allot! I have been wondering how you did the fine detail work on these. 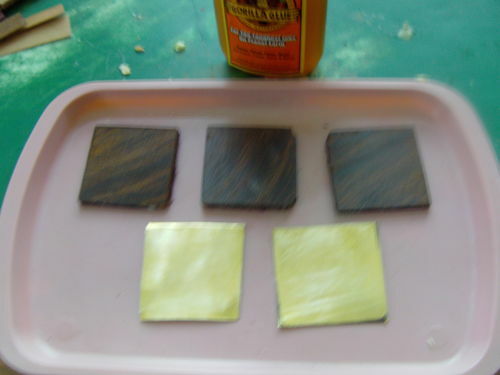 Cant wait to see the bentwood process! Thanks for posting this! Thank you Rj, when you make your first ring, please let me know how it turns out! Michael, I’m glad you enjoyed it! I’ll try on the bentwood, Just not quit ready yet. Thanks Robert that was a very detailed description of the process. 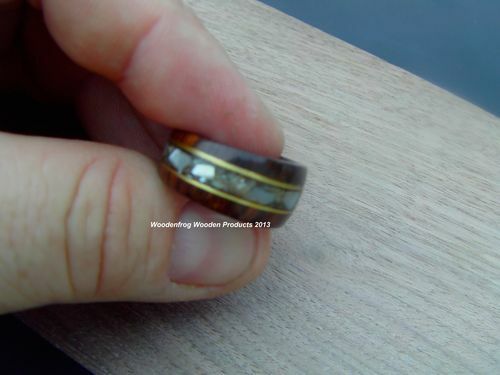 I was impressed with the amount of effort that goes into one of your rings and how well they turn out! Thank you oldnovice! glad you enjoyed it! Wow! Very nice picture blog and how-to. Exquisite ring also.